GENEVA, Nov 8 (Reuters) - China's Margaret Chan, the World Health Organisation's (WHO) top official on bird flu, was nominated on Wednesday as the new chief of the United Nations agency, diplomats said. Chan, 59, will become the first Chinese to head a major U.N. agency. 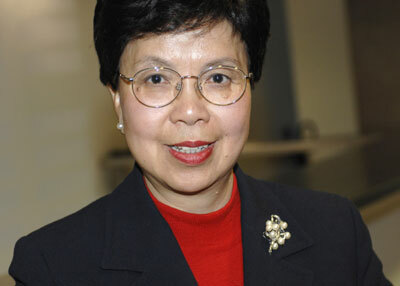 A former director of Hong Kong's department of health, she has devoted her professional life to public health. Chan had been the front-runner to replace South Korea's Lee Jong-wook who died suddenly in May from a blood clot in the brain, three years into his five-year term as director-general. The 193-state WHO's top decision-taking body, the World Health Assembly, will be asked to approve the nomination by its board at a special session on Thursday. The assembly has never rejected the board's candidate. The diminutive medical doctor stepped aside from her job as the WHO's top official on bird flu and pandemic influenza to campaign hard for director-general. The profile of the WHO, which has a two-year budget of $3.3 billion, has increased dramatically with the emergence of global health emergencies such as AIDS and threats from new diseases such as SARS, a killer respiratory illness, and bird flu. Supporters had argued Chan's election could strengthen relations between the WHO and China. She beat off challenges by Mexico's Health Minister Julio Frenk, Japan's Shigeru Omi, a senior WHO official, Spain's Health Minister Elena Salgado and another top WHO official, Kuwait's Kazem Behbehani, in final voting on Wednesday. In the final ballot, it was down to Chan and Frenk, according to diplomats. "I am very happy," said Sha Zukang, China's ambassador to the U.N. in Geneva. Besides helping prepare for a possible bird flu pandemic, Chan, who can serve two five-year terms, must confront tricky political issues. These include how to balance better access to medicines for poor countries with the drugs' patent protection that big pharmaceutical companies demand. During nine years as head of health in Hong Kong, she won praise for helping fight the world's first outbreak of bird flu (1997), deciding to cull about 1.5 million poultry.